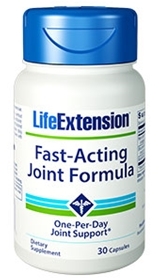 Life Extension's Fast Acting Joint Formula includes novel joint health nutrients that can be used as a standalone joint health formula or as a complement to other Life Extension bone health formulas such as ArthroMax with FruiteX B. Designed to help maintain the healthy function of the articular cartilage, the sturdy yet elastic tissue that covers the ends of bones in joints to facilitate smooth movement, Fast Acting Joint Formula contains patented forms of hyaluronic acid and keratin, and a novel plant extract Angelica gigas Nakai. Hyaluronic acid (HA) is a glycosaminoglycan (similar in many ways to glucosamine and chondroitin) that is widely distributed throughout many connective tissues (cartilage, bones, muscles tendons, ligaments, and skin). It is one of the chief components of the extracellular matrix (such as synovial fluid in joints) and contributes significantly to connective tissue integrity. Hyaluronic acid serves as one of the primary lubrication components for healthy joint cartilage, where it can help maintain normal joint function by increasing the viscosity of the synovial fluid and by making the cartilage between bones more elastic and smooth-moving. Hyaluronic acid can be delivered directly to the joint space to have a positive biochemical effect on cartilage cells, and is used medically to treat osteoarthritis of the knee. The hyaluronic acid helps increase production of the joints' synovial fluid. Not only is the patented form of keratin (a protein) highly bioavailable, it has one of the highest proportions of the amino acid cysteine, which is involved in sulphur production, an important step in the antioxidant process. Herbal extract Angelica gigas Nakai is a novel inhibitor of NF-kappa B activation and has been used in Asia for years as a guard against inflammation. Other ingredients: dicalcium phosphate, gelatin capsule, magnesium stearate, silica. Two capsules can be taken if needed until desired effect is obtained, then take one capsule daily thereafter. May provide added benefit when taken with ArthroMax or other joint support formulas.